We have reported on a wide range of energy regenerative shock absorbers over the years that most often convert linear motion into electricity. 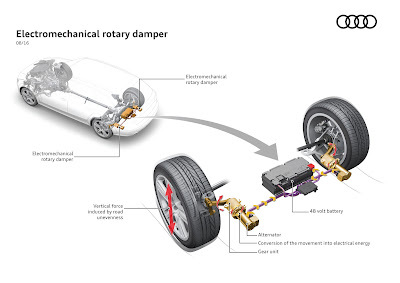 Audi is working on a prototype called “eROT,” in which electric motors replace telescopic shock absorbers in the form of electromechanical rotary dampers. The eROT system enables a second function besides the freely programmable damper characteristic: It can convert the kinetic energy during compression and rebound into electricity. To do this, a lever arm absorbs the motion of the wheel carrier. The lever arm transmits this force via a series of gears to an electric motor, which converts it into electricity. The recuperation output is 100 to 150 watts on average during testing on German roads – from 3 watts on a freshly paved freeway to 613 watts on a rough secondary road. Under customer driving conditions, this corresponds to a CO2 savings of up to three grams per kilometer (4.8 g/mi). The new eROT technology is based on a high-output 48-volt electrical system. As currently configured, its lithium-ion battery offers an energy capacity of 0.5 kilowatt hours and peak output of 13 kilowatts. A DC converter connects the 48-volt electrical subsystem to the 12-volt primary electrical system, which includes a high-efficiency, enhanced output generator. Initial test results for the eROT technology are promising, thus its use in future Audi production models is certainly plausible. A prerequisite for this is the 48-volt electrical system, which is a central component of Audi’s electrification strategy. In the next version planned for 2017, the 48-volt system will serve as the primary electrical system in a new Audi model and feed a high-performance mild hybrid drive. It will offer potential fuel savings of up to 0.7 liters per 100 kilometers.